WILLEMSTAD - The coalition agreement which was signed today for the term 2016 to 2020 does not correspond with the ministerial regulation of outgoing Minister of Labor Ruthmilda Larmonie-Cecilia. In the coalition agreement of the parties MAN, PAR, PNP, and PS, entitled 'Dignidat Humano ta Sentral (Human Dignity is Central), the government of new Prime Minister Hensley Koeiman seeks to raise the minimum wage in succession for four years to ten guilders per hour in 2020. The legal minimum hourly wage is currently 8.20 guilders. In August, two months before the election, Minister Larmonie decided this to increase it over the next four years to 11.41 guilders in 2020. 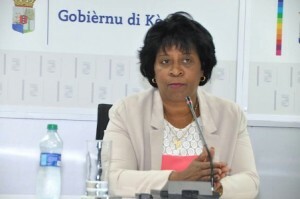 She was later criticized because she made this decision without the statutory advice of the Social Economic Council (SER), in which workers and employers are represented.